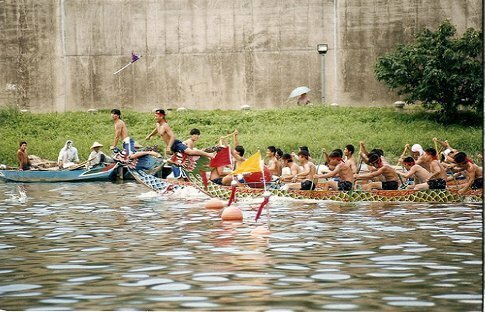 During the Dragon Boat Festival, which falls on 8 June in 2008, China’s rivers fill with colourful crafts decked out to look like dragons, from fearsome snout to scaly tail. The boat races are a lot of fun but the festival’s roots lie in tragedy. It commemorates Qu Yuan, a revered poet-statesman of the Warring States period, who threw himself into the river in 278BC to protest against the Qin state’s invasion of his patch, Chu. The dismayed common people took to their fishing boats and tried to keep the fish and evil spirits from Qu by splashing their oars and beating drums. Qin eventually conquered all its rival states and created China, but the humanitarian politician is nonetheless honoured. Spectators snack on zòngzi (triangular dumplings made of glutinous rice wrapped in bamboo or reed leaves) in memory of the rice that was scattered as an offering to the noble poet’s ghost. Get to the waterside early to see incense and gongs brought out for the blessing of the dragon head prows. The riverside is also the best place to watch the narrow boats compete to the beating of drums, while soaking up the festive atmosphere over a Tsingtao Beer (and, hopefully, avoiding the spray from the brightly painted oars). The race is won when a rower straddles his craft’s dragon head and grabs the flag, often only fractions of a second ahead of his rivals. Fuelled by all that glutinous rice, the party continues after dark with firecrackers and traditional dragon dances. The competition is also dedicated to the God of Water. Away from the pounding oars, homes fill with invocations of physical and spiritual wellbeing at a time when insects and disease are arriving with the summer heat. The herbs calamus and moxa are hung from front doors and pictures of Chung Kuei, the demon slayer, are pinned up. One tradition making a comeback, particularly in Taiwan, is the aromatic silk sachets, filled with flowers or herbs, which are given to children. Adults, meanwhile, enjoy hsiung huang wine. If, after a few rounds of this potent rice wine concoction, they can stand an egg on its end at noon exactly, they can look forward to a lucky year. Essentials: The common Chinese greeting ‘Nǐ chī fànle ma?’ (‘Have you eaten yet?’) is particularly handy on this day of dumpling munching. It shows the importance of food in a culture that experienced thousands of years of near-starvation. Local Attractions: A good place to catch Duanwu Jié is the Mi Lo River in Húnán province, where Qu met his end. The southern province, surrounded by mountains and the Yangtze River, is an agricultural area where rice, tea and oranges are grown. WWF-protected Dongting Lake, the country’s second largest freshwater lake, is home to the rare silver fish and 200 bird species, including the Siberian crane and great bustard.